Artlyst has attended The Slade School Of Art MA MFA PhD Degree Show 2016 to investigate the fresh and exciting new talent that the prestigious London art school will soon offer up to an unsuspecting art world. This renowned institution dates from 1868 when solicitor and philanthropist Felix Slade bequeathed funds to establish three Chairs in Fine Art, at Oxford University, Cambridge University and University College London. The school’s previous list of teachers is a distinguished one, including Henry Tonks, Wilson Steer, Randolph Schwabe, William Coldstream, Andrew Forge, Lucian Freud, Phyllida Barlow, John Hilliard, Bruce McLean, Alfred Gerrard. 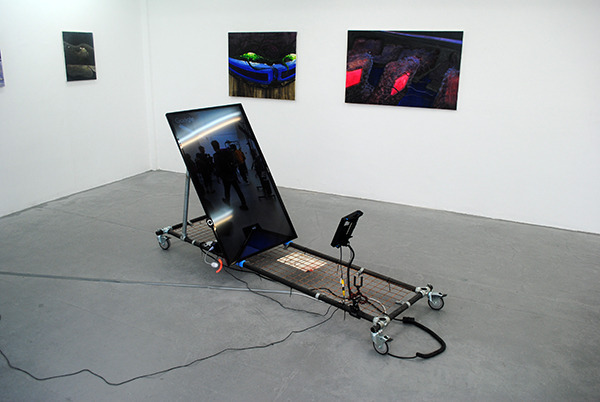 The show, consisting of the works of 64 students, represents The Slade’s potential contribution to future discourses in international art, this vast exhibition is highly varied, with the artists on display employing a plethora of languages and devices, and often a sophistication and sheen that one would expect from a postgraduate show. The exhibition certainly does not disappoint, and here Artlyst will pick the highlights of The Slade’s MA MFA PhD Degree Show 2016. Image: Teow Yue Han (MA), Smart Structure IV (Recline) 2016. The Slade School Of Art MA MFA PhD Degree Show 2016. Photo: P A Black © 2016. Teow Yue Han is an interdisciplinary artist from Singapore who explores gestures and interaction, via physicality and the bodies interaction with technology. The artist employs multimedia, contemporary technology as well as archaic forms of redundant tech, with sculptural elements. The work highlights the multifaceted sensory input of a communication age that blurs with reality, operating on multiple levels. The works imply the presence of the human form; and an ever-present interaction with technology as a relationship with an artificial reality that defines identity and group consciousness. As the atmosphere hums, the artist employs a tech-savvy Duchampian assemblage to signify new artificial layers of being and influence. 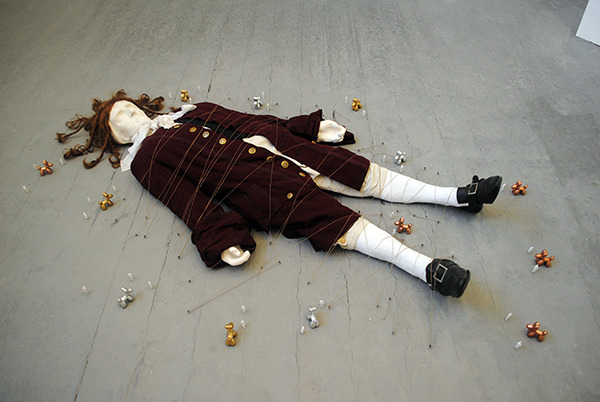 Image: Amy Herron, Untitled, installation view, 2016. The Slade School Of Art MA MFA PhD Degree Show 2016. Photo: P A Black © 2016. 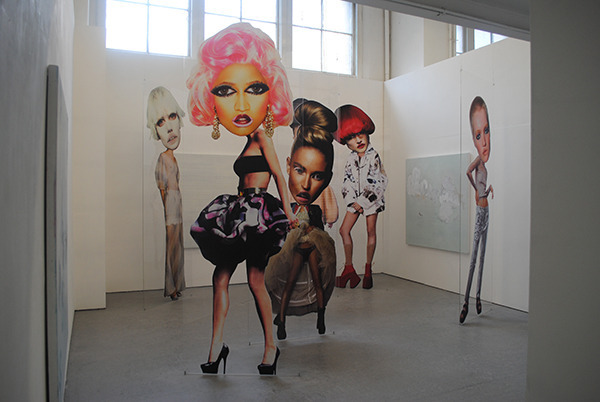 Amy Herron’s towering figures employ digital media and collage to create Frankensteinian females created from an assortment of media images of ’21st century woman’, at times intentionally confrontational and resulting in a parody of the fashion icon, supermodel, reality star, and the media’s obsession with driving perfection. The artist subverts contemporary media’s shallow interpretations of female identity, unleashing these creatures on the unsuspecting guilty. This powerful installation confronts and amuses with equal measure with subverted portraits as the ultimate rebuke to commercial stereotyping. These are grand totemic caricatures that subvert the subverted. Image: Yuhan Chang, The Birth Of The Secularization And The Modern, installation view, 2016. The Slade School Of Art MA MFA PhD Degree Show 2016. Photo: P A Black © 2016. Yuhan Chang delivers an invented conversation between a contemporary Chinese scholar, a late 20th century German jurist and political thinker, and a British fictional character living in the 17th century. 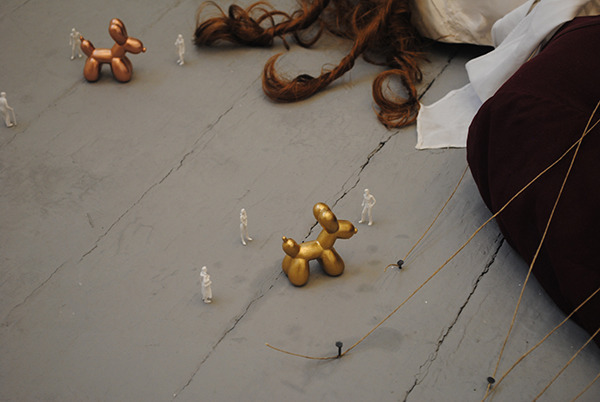 Here Gulliver is pinned to the floor by ‘artworld Lilliputians’ and guarded by multiples of Jeff Koons’ Balloon Dog. Early colonisation of the globe gives way to the homogenization of culture, as the boundaries of the geopolitical collapse under the weight of an era of virtual globalisation, where even temporal boundaries fail – with a sly dig at the empty commerciality of the process resulting in a miniature ‘Pop banality’ – and it’s hilarious to boot. Image: Yuhan Chang, The Birth Of The Secularization And The Modern, detail, 2016. The Slade School Of Art MA MFA PhD Degree Show 2016. Photo: P A Black © 2016. Paresha Amin, Amelia Barratt, Olivia Bax, Sara Berman, Josh Berry, Mariana Bisti, Harry Bix, David Blackmore, Cristine Brache, Yuhan Chang, Maud Craigie, Fiona Curran, Hannah Dargavel-Leafe, Dickon Drury, Michael Dryden, Christopher Earley, Ndidi Emefiele, Maria Farrar, Panagiotis Ferentinos, Sarah Fortais, Ayan-Yue Gupta, Myeong Su Ha, Jonathan Haydock, Marielle Hehir, Amy Herron, Katie Hubbell, Katharine Hunt, Lily Johnson, Sehee Kang, Tae Yeon Kim, William Kippax, Anna Klimentchenko, Laura Kuch, Emily Lazerwitz, Jin Kyung Lee, Samuel Llewellyn-Jones, Paul Magee, Jabulani Maseko, Tess E. McKenzie, Nicholas McLeod, Miguel Miceli, Joonhong Min, Hiroko Nakajima, Emilie-Christine P. Newman, Ulijona Odisarija, Suzi Osborn, Alexander Page, Se Rin Park, Harriet Rickard, Nina Royle, Maria Savva, Devlin Shea, Meng-Ju Shih, Henrietta Simson, Yuxin Su, Mircea Teleaga, Yue Han Teow, Owen Thackeray, Miles Umney, Mary Vettise, Marina Visic, Yuyu Wang, Jack West, and SunYin Xiaowen.